This year, you’re doing it: you’re actually going to surprise your significant other this Valentine’s Day. Really surprise them. None of this “I got you these new socks”/“I renewed our Netflix subscription!” business. You’ve already picked up (or you’re going to–really!) the perfect “WOW” gift. It’s going to blow their mind. There’s only one problem: you don’t know where to keep it. See, your significant other is nosy. Not, like, cute nosy; like, “when I find my present I’ll open it and then perfectly rewrap it so you’ll never know” nosy. But not this time they won’t! Storage Direct wants to help. Here are four places to stash that perfect present, where it’ll be safe from your beloved’s adorable but disconcertingly intense investigation. We already helped you “store” holiday presents away from prying eyes, but that was literally kid’s stuff–now we’re helping you deceive your life partner! All for love, of course. We’re like your personal Cupid–minus the hunting equipment and diaper. The ol’ “hide it in your car” chestnut is a classic for a reason. Maybe nowhere in your possibly shared home is feasible, but if you and your significant don’t share it, they probably don’t spend much time chilling in your whip. Unless you’re, like, teenagers, in which case: why are you buying an expensive Valentine’s Day present? It’s never going to last! It’s the one place in your life that’s totally separate from your SO’s: your work. 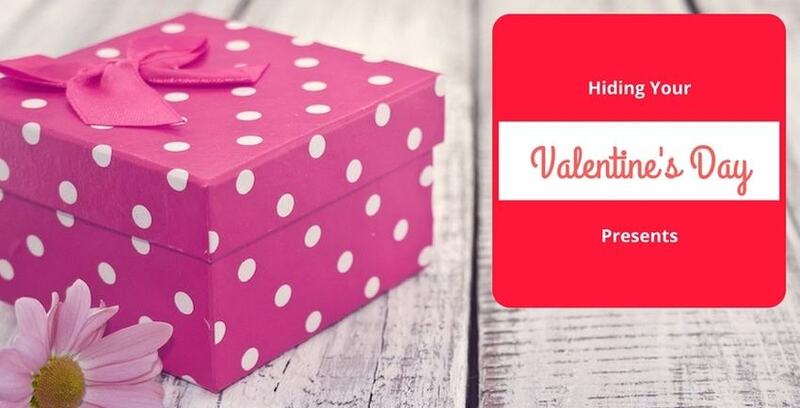 You probably don’t work together (and if you do, again, c’mon), so you could pick up your Valentine’s Day present over your lunch break, bring it back to your workplace, stow it in your desk, office, or locker, and voila! The perfect hiding place. Just… make sure to remember to take it home with you if V-day is on a weekend. One very important note: just because you’ve successfully smuggled your SO’s present into a workplace hideaway doesn’t mean you’re out of the woods. Your SO has many spies. Many spies have many eyes. Take careful note of the friends your SO has made around your workplace, perhaps at company outings, holiday parties, happy hours… These traitorous co-workers would be ideally placed to foil your elaborate Valentine’s plans. Stay vigilant. Keep it secret, keep it safe. Ok, so let us get this straight: you live together, drive together, work together?! You’re making this tough for ol’ Cupid. Luckily, we have a solution: your gross personal hygiene habits. Seriously–no one likes going through their SO’s clippers, tweezers, deodorant, and stuff. It ruins the “illusion.” That nasty, toothpaste-encrusted wicker basket you keep under the bathroom sink might be your last hope for a great Valentine’s Day! Boy, that’s a sentence, huh? There are a couple ways this won’t work: first, you can’t change your hygiene habits. If you keep your toothbrush out in the open like some kind of animal, suddenly stashing it in a drawer is a clear signal for an intrepid gift-detective. Next, don’t do this if you get cleaned up at the same time. They’ll see it. Come on, think about this. Cupid’s not a miracle worker. Ok, you’re one of those couples with no boundaries. You use each other’s toothbrushes and stuff. Cupid is going to throw up. You’re making Cupid sick right now. Anyway, we have one more sinister plan: put the present in the most obvious place imaginable. Seriously, why not? Put it on your mantle place, or the dashboard of your car. Then, never take your eyes off of it. Stand guard over your hard-fought gift, and brook no sidelong gaze, begging, or bribery. We’ll give it to you straight: you’re probably not going to get much sleep. Night gathers, and your watch begins. You’re going to be a paranoid mess. But it’s going to be worth it, because imagine the look on their face! The present is right there. They’re so close. It’ll be like torture for them! Isn’t that what Valentine’s Day is really about? No, Cupid doesn’t have a date this year. Why do you ask? Take our advice (or don’t), go out and grab the ultimate gift (or don’t), but whatever you do, make your SO feel special. It’s not really about the gifts or the rituals, it’s about how you can show your loved ones that you care about them and think they’re special. …Ok, it’s also about surprising them with really great gifts. If none of our little pro-strats are working for you, you could consider getting some extra storage in the form of one of our units. We have a unit suitable to accommodate virtually any size or specification. It’ll be your own personal Cupid’s Lair! …We’ll work on a name that sounds less like a bar for serial killers. Happy Valentine’s Day!